You may well have heard this story before, but it’s a great one to be reminded of from time to time, particularly at the start of a new year. He continued, “The other is good – he is joy, peace, love, hope, serenity, humility, kindness, benevolence, empathy, generosity, truth, compassion and faith. 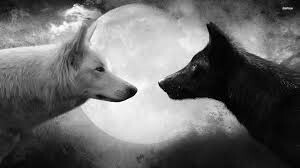 A story we heard over the weekend beautifully illustrate how this choice plays out in our lives – and how the good wolf can instantly transform what seems like a dire situation into a positive one. A few weeks ago a garden shed was broken into. Not an unusual occurrence, but devastating for the person concerned. Let’s call him Peter. When he found it, the door was hanging off its hinges and the contents strewn far and wide. A brand new bike, complete with padlock, was gone. But, very quickly, the feelings of being a victim were quickly replaced by some more surprising ones. How grateful he was that he could afford a new bike. How fortunate it was that nothing else of real value was stored in the shed at the time. And, really, wasn’t the whole thing a reminder to sort out his shed and ensure it was properly secure in the future. And now the good wolf was firmly in control, his thoughts turned to the person who’d broken into his shed. How fortunate he was that he’d never felt a desire to steal from anyone. How lucky he was never to have felt the need to break into another’s property to see what he could find to sell for a few pounds. Feelings of compassion quickly replaced those of indignation towards the perpetrator. True, the incident wasn’t one he would have wished for, but there were a lot of positives when he took the opportunity to look for them. And he chose to focus on those. Now let’s go one step further. Remember the butterfly effect we mentioned a couple of blog posts ago? Like the ripples on a pond, everything which happens in our lives has an infinite number of repercussions that can never be predicted with any accuracy beforehand. Perhaps not having a bike for a few days meant that Peter didn’t go for a ride that would have resulted in him having a serious accident. Or kept him at home to see an old friend he hadn’t seen for years, who’d dropped in on the off chance. Perhaps looking for a new bike led to a chance meeting with a stranger and meeting the love of his life. And that’s the point. We can never know beforehand – or often after (!) – what the results of the smallest event in our lives will be. Let alone the big ones. Instead of automatically labelling every event in our lives as “good” or “bad” why not choose to look for the good in everything that happens? Think of it as keeping all your options open. And, “yes”, sometimes it’ll be easy to do, other times less so. Perhaps the “good” will be immediately obvious. Or you may have to wait for several months – or years – for it to become apparent. But it’s always there IF you choose to look for it. If you want to see this in action look no further than your own life. Cast your mind back to those seemingly devastating events which, with the benefit of hindsight, turned out to be the best thing that could have happened to you. We all have them, it’s simply a case of choosing to let the good wolf take control and steer you back on to a positive path.